Feed Me, a drum & bass, electro house, dub step dance music producer and DJ from Hertfordshire, England, is no newcomer on the scene. His debut album, Feed Me’s Big Adventure, was a huge success with a total of six tracks charting in the Beatport Top Ten, and his second EP, To The Stars, exploded onto the scene as well. 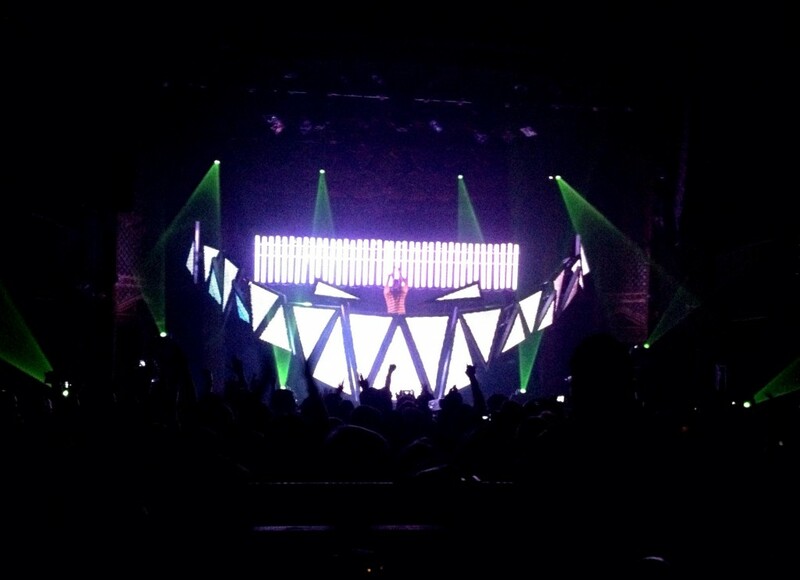 Feed Me launched his North American WITH TEETH Tour” March 12, 2012 in Seattle in support of his latest release ESCAPE FROM ELECTRIC MOUNTAIN, which hit #1 on the iTunes Top 10 Dance Albums charts upon its release on the deadmau5-helmed mau5trap label. This is his first headline tour with over 25 appearances, including performances April 13th and 20th at the Coachella Valley Music and Arts Festival. Once the curtains dropped from the teeth”, the crowd blew up into screams and yeas'” to the site and sounds before them. Upon viewing the teeth” the floor was lit up with cell phones recording the first few minutes of Feed Me’s show. His full stage production consisted of a 20-foot wide set of LED teeth, which lit up to his beats and drops, along with lasers bouncing off the ceiling in circle and flower patterns. The 20-foot wide set of LED teeth altered between mesmerizing scenes of space and time, designs and colors, to an ominous grin of pulsating lights; all synced perfectly to his music. The crowd, consisting mostly of furry-boot-wearing, pacifier-sucking twenty-something’s, with quite a few under-agers as well, danced with their glow sticks to the mix of drum & bass, electro house and dub step. This having been my third dub step/dance show, I can now understand why people would pay $30-35 for a show. You not only get to witness an ultimate stage and light show, but you get to revel in the bass turned up to where it reverberates throughout your body while shaking what you got, waiting for the drop of the bass. My photographer and I had the pleasure of viewing Feed Me from the sound booth. Being in the center of the mix allows you to get a new feel and view of not only the stage and performers, but of the crowd as well. Everywhere I looked in the Ogden, I saw hands pumping in the air, bodies swaying and heads bobbing to the flowing beats and transitions from song to song; all masterfully done by Feed Me.